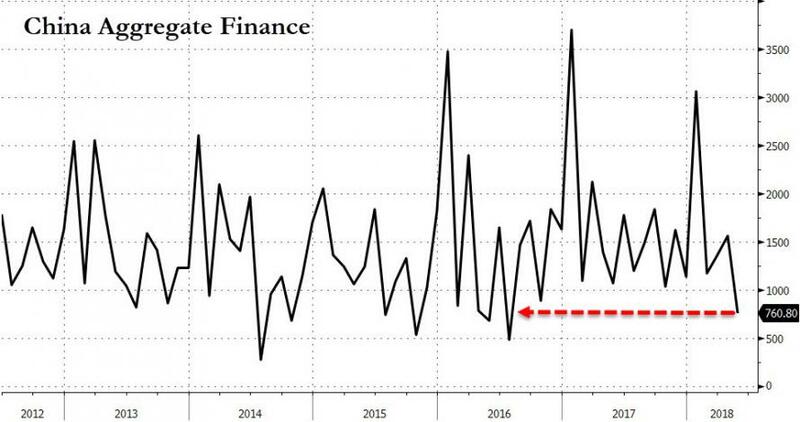 It was just yesterday when we noted the sharp collapse in the Chinese credit impulse, when in May, the PBOC reported that Total Social Financing grew at the slowest pace since July 2016, as a result of a full-blown crackdown on China's shadow credit system. Barely 24 hours later, China served not one but two major surprises that were the direct result of the sharp slowdown in China's credit dynamo. 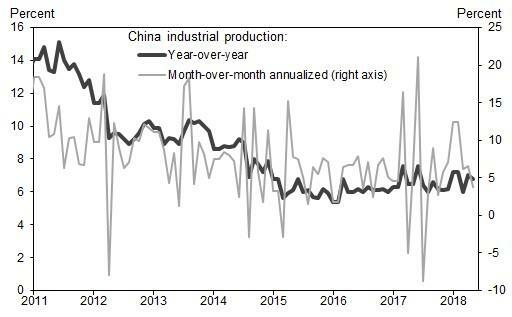 On Thursday China reported activity data including industrial production, fixed asset investment and retail sales, which missed across the board - in the case of fixed investment the weakest on record - and were the most definite confirmation yet that China’s economy is finally starting to get hurt under the weight of a multi-year crackdown on risky lending that has pushed up borrowing costs for companies and consumers, and has led to a surge in corporate defaults. The number suggested further weakness ahead if Beijing continues with its crackdowns on pollution, questionable local government spending and off-balance sheet “shadow” financing, which as we reported yesterday tumbled at the fastest monthly pace on record. 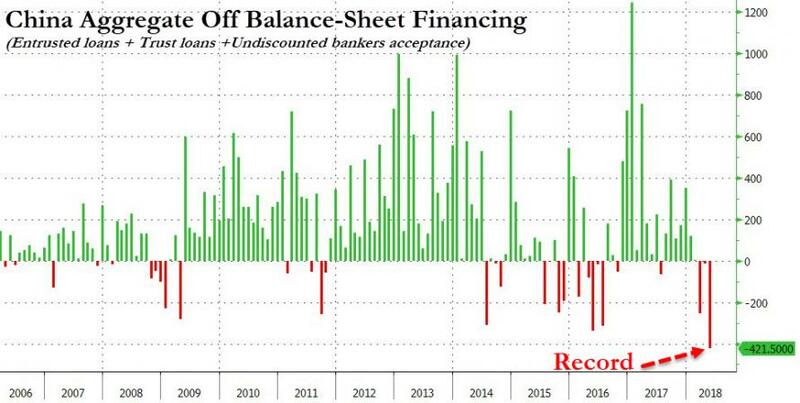 The data, which showed the slowest investment growth in over 22 years, “was all shockingly weak by Chinese standards,” according to economists at Rabobank who warned to “get ready for headlines talking about Chinese deleveraging hitting the economy – except it isn’t even deleveraging yet! China is walking more of a tightrope than markets believe – and the data underline that issue clearly." Industrial production (IP): +6.8% yoy in May, missing consensus est of +7.0% yoy; and down from April: +7.0% yoy, +6.6% mom annualized. Retail sales: +8.5% yoy in May, missing conesnsus of +9.6% yoy, and down from April: +9.4% yoy, the slowest since June 2003. Fixed asset investment (FAI): +6.1% ytd yoy in May, missing consensus est: +7.0% yoy; and same as April yoy: +6.1%. This was the slowest pace since at least February 1996. As Reuters notes, China has been walking a fine line between rolling out measures to curb financial risks and pollution and tapping the brakes so hard that business activity slows sharply. Much of their effort so far has focused on the banking sector rather than corporate debt reduction or deleveraging - possibly explaining why China’s headline growth has been so surprisingly solid, prompting some such as Morgan Stanley to wonder if Chinese credit impulse has decoupled from the Chinese economy. Now we can confirm it has not as official and unofficial gauges are now showing the regulatory crackdown is starting to filter through to the broader economy, with companies complaining it is harder to get financing and a growing number of firms defaulting on bonds. 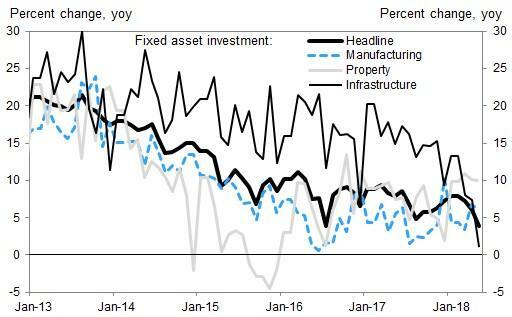 China’s fixed-asset investment (FAI) growth cooled to 6.1 percent in January-May from the same period a year earlier, the slowest pace since at least February 1996. Meanwhile, growth in infrastructure spending, a powerful economic driver last year, slowed to 9.4 percent in the first five months, from 12.4 percent in January-April. At the same time, retail sales grew 8.5 percent in May, the slowest since June 2003. The slowdown was due to seasonal factors and consumers delaying purchases, Mao Shengyong, a spokesman at the National Bureau of Statistics, told reporters. Of note: auto sales dipped 1 percent. China’s auto industry said on Monday that some car buyers were holding off on purchases, presumably until import tariffs are cut from July 1. Worse, one of the brighter spots of China's economy is set to turn dark: while trade was strong May, analysts expect exports may also lose momentum in coming months amid rising trade tensions with the United States. Chinese exporters have been front-loading their shipments due to changes in the international trade environment, commerce ministry spokesman Gao Feng said on Thursday. As the WSJ reported, on Friday Washington is expected to release a list of some $50 billion worth of Chinese goods that will be subject to a 25 percent tariff. But it is not clear when U.S. President Donald Trump would activate them, if he chooses to do so. Realizing which way the economy is headed, shortly before the data was released, China’s central bank sparked concerns over the health of the economy when instead of hiking by 5bps in response to the Fed 25bps rate hike as it has traditionally done, it left short-term interest rates unchanged, surprising markets which had expected it to follow a hike by the Federal Reserve. As Rabobank analysts noted, the "shockingly poor" readings explain the central bank’s decision to keep rates on hold. Making matters worse, China's recent easing measures appear to have had little positive impact on the economy. Since April we have seen the government cutting RRR, lowering interbank rate, loosening collateral standards for commercial banks when utilizing MLFs and loosening requirements on deposit deviation, stating the desire to support domestic demand and, equally importantly, not emphasizing the importance of deleveraging (instead referring to “controlling” or “stabilizing” leverage). Furthermore, anecdotal news reports indicate some PPP projects are being brought back to construction after being suspended in late 2017/early 2018. As Goldman notes, up to this point, the policy loosening is primarily due to concerns over the impact of the US-China trade disputes on growth. In our view, other contributing factors may be (1) the perception that growth is not uniformly strong, (2) lower-than-expected CPI inflation, and (3) high profile cases of defaults in fixed income markets. However, the easing measures thus far have not translated into strong liquidity supply for the real economy. The below expectations May TSF data led to a lot of concerns about policy effectiveness given the continued tight financial regulatory environment. The government does not have perfect control over liquidity supply to the real economy on a real time basis. Given the bias to keep policy loose during the trade dispute and today’s data, Goldman believes that it is likely that the government will take market or/and administrative measures to prevent repeated downward surprises in credit supply and growth. In other words, it can't hike over fears of slowing down the economy too far, and it can't ease or else risk another round of capital outflows and a spike in inflation.